Photographer: Andrew Yee. Model(s): Crystal Noreiga, Krusha Lamar. Source: Hunger Magazine. Stylist: Kim Howells. Makeup: Marco Antonio. Hair: Nick Irwin. Crystal Noreiga & Krusha Lamar dream into another dimension, in “All That Glitters” is gold by Andrew Yee for Hunger Magazine #13. Two becomes one as they spin into endless fun, aiming to uncover the moons of the midnight sun. Their limbs extend to the furthest reaches of the imagination, and then back again as if they’d never left. The art of constant movement is a subtle yet stunning sport. To be in sync to such a degree that we forget we are looking at two unique souls, is a compelling prospect. Crystal & Krusha float free wrapped in each other’s energy, as they fly through the sky on a crazy kind of high. Beauty blooms in a bouquet of taut bodies, as they stretch to connect to the undulating rhythm of the night. No beginning and no ending marks this editorial by the fluidity of fashion. Yee celebrates the choreography of spectacle, as beaded ensembles are cast in dance of design. Kim Howells celebrates the season of scintillation, with styles so spectacular they resemble costumed garments. Beaded ensembles are made into Objet d’art, as the vastness of variety is created out of applied accouterments. Bodies bend in linear format, featuring the fundamental beauty of the bones. Blooming like flowers on a bud, the torsos twist and turn in a sinewy stretch of satisfaction. There is no beginning and no ending in this exquisite editorial that’s marked by fluidity. Positioned in a grande Pas de Deux format, their limbs become one within a maze of movement. Dynamic designs freely collide collaborating under the bouncing of light. Capturing a ballerina in flight, the definition of Adagio takes positions that flow in a succession of slow, lyrical bends. What the Frock? Disco jumpsuits celebrate the era of enticement, while a metallic crop-top looks like the two have been fused. Shiny styles speak to the element of edge, with a dynamic mix of dramatic designs that dare to dream. A mosaic of shiny materials go from sequins to Lamé, while bubbles keep things popping and appliqués transform a skirt into a mermaid tail. 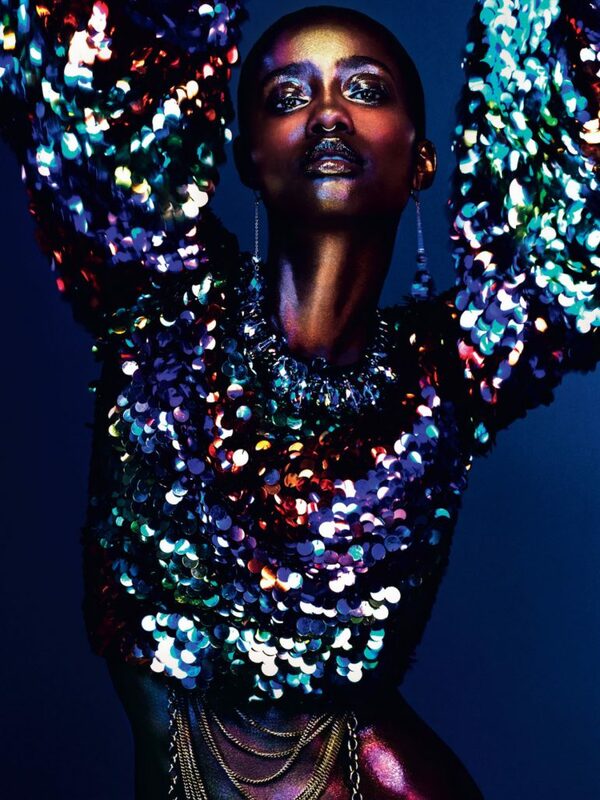 Sparkling in a sea of sensation, disco glam gives garments their day in the sun. Beauty blooms, as Marco Antonio’s makeup is a poetic attempt to ascertain the essence of being. This story is a celebration of skin. By creating a picture that allows the eyes to move down the slope of the skin, we are able to appreciate every angle. The high points shine while the depths and dimensions sing. This isn’t about changing the look it’s about uncovering the inner being. Antonio takes colors that compliment rather clash… with colors that highlight rather than hinder. With this we are able to bask in the beauty of the body. The music of modern makeup sings as we see the line of their features shine. Surrounded by a halo of white light, the eyes come alive with a sepia shade covered in a glowing hue. A glimmer continues down the center of the face, and then moves over the mounds of the mouth. Lips are lined with a succulent tint, as the golden tone touches every inch of skin. Appearing like they’re lit from within, the light doesn’t bounce off their skin, rather, it radiates down the body’s perfect pathway. 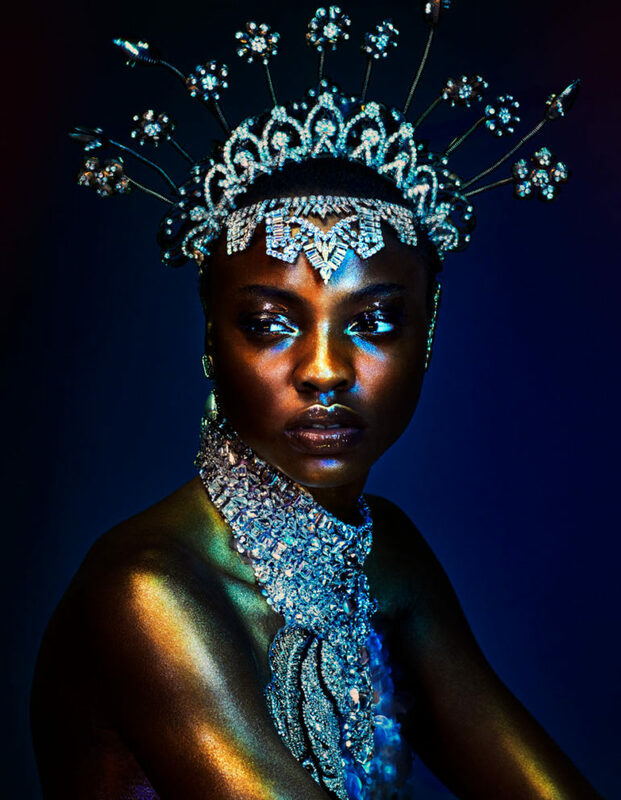 Bejeweled & Beautiful… Krusha comes in quiet with a cool head piece that wears like a golden tiara, while Crystal gets dramatic donning a bejeweled crown made for a queen.